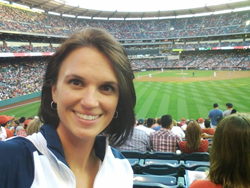 The Far West Athletic Trainers' Association Winter Quarter winner of the Excellence in Athletic Training Award is Jessika Hunt MEd, ATC, NASM-CES. “In this field, there are days that are a grind, and then there are days like today that renew your energy." This quarter’s winner is Jessika Hunt MEd, ATC, NASM-CES. Jessika was named to the University of California, Riverside Intercollegiate Athletics Training Staff in the summer of 2007. She joined the Highlanders’ program after serving three years as the head athletic trainer at Mount St. Mary’s University in Maryland. She is a 2000 graduate of East Carolina University, she also worked in the George Washington athletic training department. She completed her Master’s Degree in exercise science in August 2006 from the California University of PA. Please join us in congratulating Jessika on winning the Excellence in Athletic Training Award!